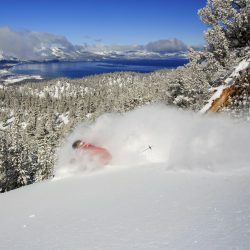 Top Ten Reasons to Visit Lake Tahoe RIGHT NOW! SNOW, SNOW and LOTS OF SNOW! When it comes to snow, size matters. During the first two weeks of January, Lake Tahoe has been blanketed by more than 200” of fresh snow, over 16 FEET! These historic storms have already broken a new record for January snowfall and the resorts surpassed their average snowfall totals for the season. And the typically snowy months of February and March still lie ahead! Looking to make the most out of your day on the slopes? There's an app for that. In fact, there's quite a few noteworthy mobile apps designed to enhance your experience on the mountain and make it easy to meet up with friends and family. And for the competitive crowd, there's plenty of ways to track your vertical and share your results via social media sites. Here's a quick look at a handful of apps worth downloading prior to hitting the slopes in Tahoe.